Kira and Odo are returning to DS9 after a mission to a remote Bajoran colony on the border of the Cardassian neutral zone, they detect a ship being attacked by the Maquis and give chase. The fleeing ship crashes into a moon of a gas giant and they land and investigate a cave complex, time is short so Odo and Kira split up. Odo then hears Kira calling and he finds her trapped in a crystalline structure which resists damage and phaser fire infact the crystal grows as it absorbs the energy, transporters and comms fail while Odo attempts to figure out a solution to freeing his friend. Meanwhile back on DS9 Nog has approached Sisko with a request to be his apprentice (Ferengi tradition when a boy becomes a man), he offers a bag of latinum and makes it clear he wishes to join Starfleet. Sisko is a little confused but agrees to think about and then asks Dax to assign him to an inventory of a cargo bay full of valuable cargo as a test. Nog completes the inventory with no problems at all but Sisko while accepting his talents needs to understand why Nog wants to join Starfleet and when he refuses to write the recommendation letter Nog finally opens up. It turns out he knows that business is not for him (same for his father) but he has inherited the engineering skills of his father and the never say die attitude of his uncle and Sisko agrees that Starfleet could indeed use such a person in it's ranks. Kira is close to death as the crystal has nearly covered her body and Odo is no closer to freeing her but they continue to talk and bit by bit Odo is opening up until he finally confesses that he won't leave her to die as he loves her and she admits that she loves him. Still the obsessive side of Odo seeks a solution until he realises nothing really makes sense and what he knows simply doesn't add up and at that point he realises that this being is not Kira and behold the Founder appears before him and admits this was a rouse to break the link between Odo and the solids. Heart of Stone kicks off with Odo and Kira on a runabout, not quite sure why the Bajorans are so keen to colonise worlds close to the Cardassian neutral zone but ok we'll go with it but when they came across the Maquis why didn't they immediately call for assistance or at the very least notify DS9 of the intentions after all they were going towards the badlands. It was also fortunate that the moon had a suitable atmosphere and a cave structure which protected them from what was supposed to be a pretty harsh environment which blocked comms and transporters. I wasn't quite sure why the beacon Odo launched would take two days to get a signal to DS9, maybe it had to be well clear of the gas giant but as a mayday device that sort of delay could be critical. I had no problem with Kira getting stuck as I think the cave system was a lot darker than it looked on out screens and the interaction between the two of them was interesting. I do not know if it was deliberate but the close ups on Odo's face showed some flaws in his mouth/lips which made me wonder how close to his regeneration cycle he was, it was never mentioned but it would seem to be relevant. The confession of his love for Kira was of course no surprise to Odo but on second or third viewing has lost a lot of it's impact but again the fact that this is a setup and Odo finally figures it all out makes it worthwhile. 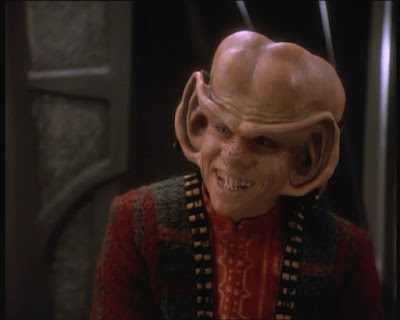 Nog of course has his own reasons for wanting to join Starfleet and I liked the test that Sisko gave him although I expected Dax to be more supportive of Nog but he passed the test and finally Sisko got to the truth and that was very satisfying, nicely done by Aron Eisenberg. Heart of Stone has two very definite plots but both are pretty much covering the same situation, the main characters are being forced to admit to themselves and others the core emotions that are driving them and you know they both work especially the Nog story. Highpoints were the whole performance by Aron Eisenberg, the explanation of why Odo was called Odo and daft as it sounds the best line was from Quark in his very brief appearance, "You're both insane".